The darker side of Aleatha is back!!! I love this side of her writing, she gives us characters that we love to hate and hate to love and Ripples is no different! Also, look how awesome this cover is! Not only do we get some insight years later into the Rawling’s family but also some friends that we’ve enjoyed through the Consequence series make an appearance. In Ripples we get to know the baby of the family, Natalie Rawlings. When things don’t go as expected in college. The anxiety she feels about going home to bear this disappointing news increases. The trip back home, takes a turn in the wrong or right direction (you need to be the judge of that). Things she would never expect to happen, things she is not equipped or ready for ensue. Dexter, whom you will either love or hate has a different plan in place for Natalie. The more you read the more you will learn what’s behind his motivation and determination. 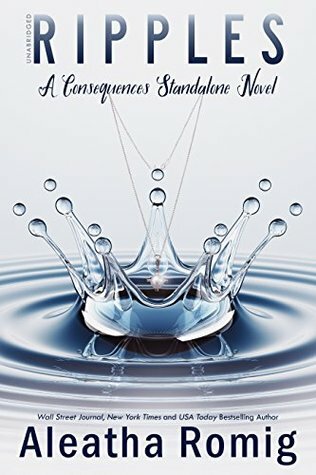 Ripples is dark and twisty mixed with plenty of steam and deceit, much like the Consequence series, someone is always watching. I couldn't turn the pages fast enough. omg can't wait to read- got it thanks so much for review Terri!